An entertainment complex in the northern English town of Stockport, designed by architecture firm BDP, has been named the UK's worst new building from the past year. 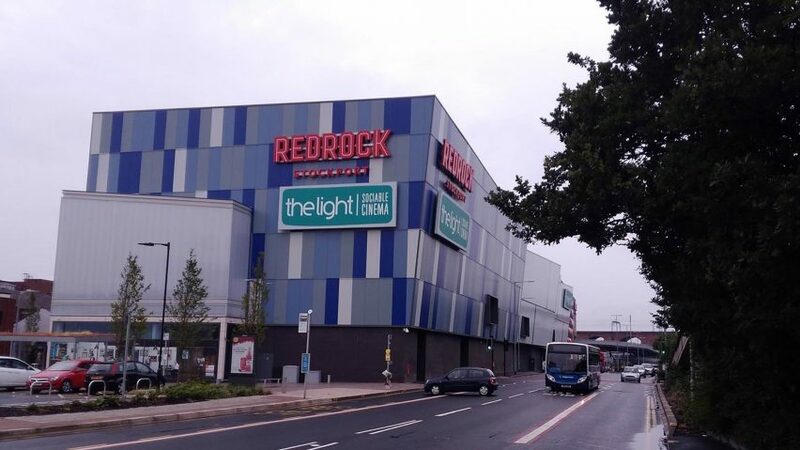 The leisure complex, called Redrock Stockport, is the winner of the Carbuncle Cup 2018, an annual competition organised by architecture website Building Design (BD) to find the worst buildings in the UK. Judge "sorry for the people of Stockport"
The £45 million development, located beside the M60 motorway to the south of Manchester, was described by judges as a "missed opportunity". "You feel sorry for the people of Stockport," commented one judge anonymously. Clad in grey, blue and red patchwork panels, the building contains a multi-screen cinema, shops, restaurants, a gym and a multi-storey car park. A 3D tour of the cinema is available on its website. UK-based BDP designed the leisure complex as part of a £1 billion regeneration of the Stockport town centre for the local council. It was selected as Carbuncle Cup winner by BD editor Thomas Lane, BD architecture critic Ike Ijeh, author and critic Jonathan Glancey and Rosemarie McQueen, a commissioner for Historic England. Building "excuse to foist bad architecture on struggling community"
"Urban regeneration can be a good thing," said the judges. "But when it becomes an excuse to foist bad architecture on to struggling communities in the cynical pursuit of an 'anything is better than what was there before' methodology, it simply recycles the resentment regeneration was supposed to redress." "The fact that there are multiple examples of this kind of garish, soulless leisure shed architecture in UK towns doesn't let Redrock off the hook: it puts more of those responsible for our built environment in the dock." The building won the award from a shortlist of six projects that completed this year. Three projects in London were shortlisted: Lewisham Gateway by PRP Architects, Haydn Tower by Rolfe Judd and 20 Ambleside Avenue by Pace Jefford Moore Architects. The shortlist was completed by the Shankly Hotel in Liverpool by Signature Living and Beckley Point in Plymouth by Boyes Rees Architects. In its award's announcement, BD acknowledged that Redrock Stockport has proved popular with locals. This fact was emphasised by the council, which responded to the announcement by saying it was proud of the development. "We're very proud of the impact Redrock has had on our local communities, exceeding all our expectations both in terms of a fantastic new leisure facility visited in its first 10 months by over half a million people and the number of jobs it has created," Kate Butler, Stockport Council's cabinet member for economy and regeneration, is reported as saying in the Manchester Evening News. "The thousands of people visiting every week to enjoy food, drink, entertainment and exercise are the true measure of its huge success," she continued. "As with previous winners like MediaCity  we know that it's what's inside that really counts, and we encourage people to visit and experience Redrock for themselves." Last year the Carbuncle Cup was awarded to a pair of towers outside London's Victoria station, designed by PLP Architecture. In previous years Rafael Viñoly won the award for the Walkie Talkie skyscraper in London and Grimshaw was named the winner for it's Cutty Sark tea clipper museum.